New Zealand kumara salad is perfect served alongside grilled lamb chops. Kumara are sweet potatoes and were originally brought to New Zealand by the Maori people. Kumara is and has been a staple ingredient in the Kiwi diet. This is a lovely salad with the roasted sweet potato adding a touch of sweetness to it. 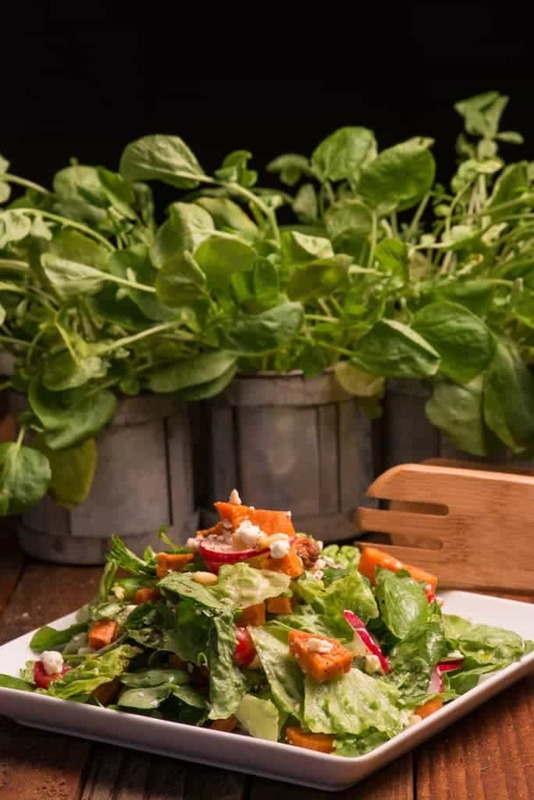 The salad was also made with watercress which is a native ingredient found along the edges of fresh water rivers and creeks around New Zealand. It can be enjoyed raw or cooked and has a mild mustard flavor. In New Zealand it is called Kowhitiwhiti in the Maori language. The salad also had fresh crumbled goat cheese and some pine nuts. 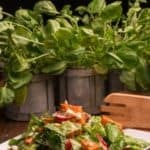 The combination of texture and flavors is superb, you will love this salad. Place the diced kumara on a baking sheet and drizzle with some olive oil, sprinkle with salt. Roast for 25 minutes or until tender. Set aside to cool. In a bowl mix together all the salad ingredients. Plate and then drizzle some good olive oil and balsamic vinegar.